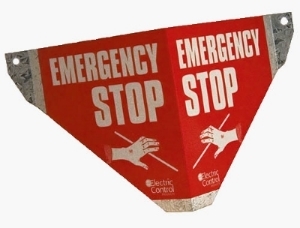 The Safe-T-Sign is a highly reflective emergency stop sign for conveyor lanyard switches and pull wires. The Safe-T-Sign is a highly reflective emergency stop sign for conveyor pull wire lanyard switches. The bracket is simple and easy to install on existing or new installations and is designed, when mounted correctly, to be seen at every 15 m point. The Australian Standards 1755-2000 Clause 2.9.4 (c) states that: Signs shall be provided at each end and every 30 m along a conveyor where a pull wire is used e.g. emergency stop. A sign featuring an Emergency Stop button is also available.